The inconceivable third Nativity account in the gospel narratives comes from Saint John's opening remarks in his gospel. "In the beginning was the Word, and the Word was with God, and the Word was God. The same was in the beginning with God. All things were made by him; and without him was not any thing made that was made. In him was life; and the life was the light of men. And the light shineth in darkness; and the darkness comprehended it not." Now, on the surface of it, it would not appear that a Nativity account such as the ones narrated by Matthew & Luke is being presented in the gospel of John. I beg to differ it is all there for one that has eyes to see. The key phrase in the above quote from the gospel of John is "in the beginning". These words are actually the translation of the first word of Genesis: Bereshith. Isn't it extraordinary that Saint John would choose the same concept (in his words) as that which Moses, himself, chose to start the Torah? Yet, both Matthew & Luke also chose this same concept to begin their gospel. But it does not appear that way does it? It is also interesting that John would immediately begin with talking about John the Baptist after his Nativity remarks as does Matthew & Luke (and possibly Mark). Actually we may have a unanimous consensus, on the Nativity account, with all four-gospel writers but Mark's first verse is a bit ambiguous to determine if he was cutting the Nativity story short. The fact that Mark uses the word "beginning" is very suggestive. It is unusual for a Christian to study the Hebrew text of the Old Testament when he has a translation in his native tongue at hand. But oh, what the Christian is missing by not studying the alphabet of the Hebrew language. The New Testament was written with such knowledge. Not availing oneself of the Hebrew language in relationship to the message of the Old & New Testaments prevents the Christian from gaining any sense of what his religion is about. One of the most enigmatic secrets of the Hebrew language is that the last four letters of the Hebrew alphabet spell out the word 'Christ', but it spells it out in Greek. These four letters are, reading right to left "TAV, SHIN, RESH, KOPH (QOPH)", which spells out k-r-s-t -- Christ. A startled Jewish writer named Robert M. Hoffstein, who reveals this data in his Introduction of "A Mystical Key To The English Language", revealed this nuance. In his own words Hoffstein says the following (pgs 1, 2): "I was twenty-two at the time and with my youthful enthusiasm thought I would try it out on a yeshiva bucher friend of mine. For him the Talmud was the only orthodox study; Qabbalah was out of bounds--"evil". I laughingly told him, point blank, that Christ was hidden in his own alphabet in a way that he would never suspect. He looked at me with wide-open eyes, anxious to hear what I was about to say, ready to pounce on me for my unorthodox leanings. I simply repeated that "Christ" was the grand finale, the coda of his own beloved Aleph-Beth. Instead of berating me, as I thought he would, he broke out into a sweat. The 'revelation" had made quite an impact on him." This was an important revelation to me though I had already become familiar with the last four letters of the Hebrew alphabet with my analysis of the first word of Genesis. I had not known at the time that these letters spell out the word Christ." "TAV, YUD, SHIN, ALEPH, RESH, BETH"
In the Zohar in the prologue we are told that the 22-letters of the Hebrew alphabet came before the Lord of the world to ask him to make the world through one of them. From the last letter: 'TAV', of the Hebrew alphabet, until the first letter: 'ALEPH', they all filed before the Lord of the world to each plea his petition. Each was rejected for some reason or other until Beth appeared and was accepted for the role as the first letter of Genesis. Thereafter, anything that came into the world would be made in the image and likeness of Beth. The reader should realize that allegorical texts like this were written by ancient mystics to aid us in understanding the Torah. In no way am I suggesting that the letters of the alphabet pranced before the Lord of the World. In Hebrew tradition the 22-letters are the elements of creation. Below we can see in the word Bereshith this process, of the 22-letters of the Hebrew alphabet coming before the Lord of the World, taking place. We see TAV, SHIN, & RESH going in sequence equidistance from each other in the word Bereshith. By studying this pattern and reading the Zoharic account of the alphabet's narrative we easily can surmise that as each letter is rejected for whatever reason they circle around to exit the material creation. The incredible thing is that the first word of Genesis: Bereshith, is suggesting that the process is a continuous ongoing process. This implies the 2nd Coming of Christ in the first word of Genesis. This is because in the word Bereshith we see the letters Tav-Shin-Resh. This implies that they have returned. Since these letters spell out the word Christ with Qoph it would be the 2nd Coming of Christ. It also suggest an eternally ongoing (never-ending) returning process. The #10: YUD according to the Zohar represents YAHWEH: the Lord of the world. So we can see as Tav passes Yud Shin is next but Aleph is on his way out. But notice how when TAV, SHIN, & RESH come into creation the next letter, before Beth, would logically be Qoph (Koph) in sequence. So the first four letters into creation spell out the word Christ. This is why Saint John confidently wrote "In the beginning was the Word, and the Word was with God, and the Word was God." Actually the Zohar infers that the Aleph symbolizes the Elohym. We, therefore, have the Elohym, Yahweh, and the word Christ not quite spelt out in the first word of Genesis. We will see it spelt out in a moment. In the Jewish tradition it is taken for granted that the letter BETH written into the text has a white area around it, which produces the 17th (Star in the Tarot Cards) letter of the Hebrew alphabet called Pei. Therefore, Beth and its ghostly guardian mystically combine (2 + 17 = 19) producing the missing letter: Qoph, in the word Christ. There are Hebrew works on the Hebrew alphabet that explain these nuances. Hence we have the Trinity in its totality in the first word of Genesis. This is why Saint John could so confidently write concerning God and what took place "in the beginning". When Christians talk of God they infer the Trinity at all times. The fact that Qoph is mystically present in the first word of Genesis implies that the esoteric science is inherently symbolic in the worlds makeup. It explains why humans cannot read, with their five senses, this esoteric system. It can only be known with reason, reflection, and revelation (intuition). 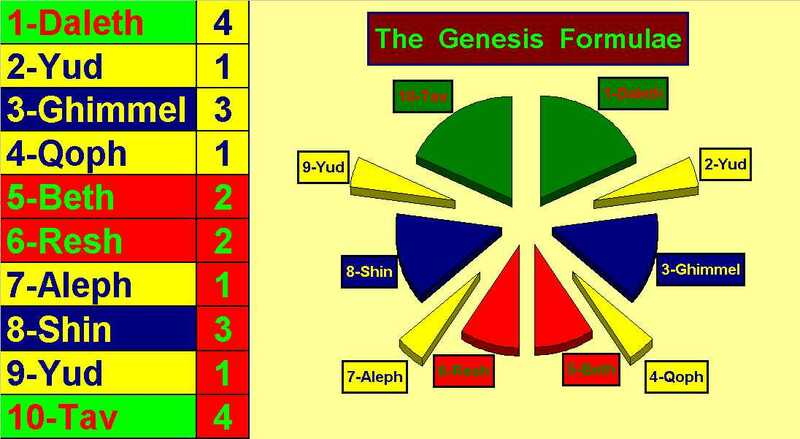 Based upon the pattern in the first word of Genesis and the mystical story of the alphabet in the Zohar it was not difficult to extrapolate The Genesis Formulae from the word Bereshith.